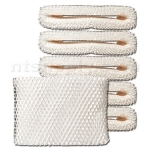 These high quality filter wicks are made by a leading manufacturer to fit Portable Cool Mist Humidifiers from Holmes, Sunbeam, Bionaire and others. Approx. Dimensions: 6 1/2" H x 5" ID x 7" OD x 1" Thick.